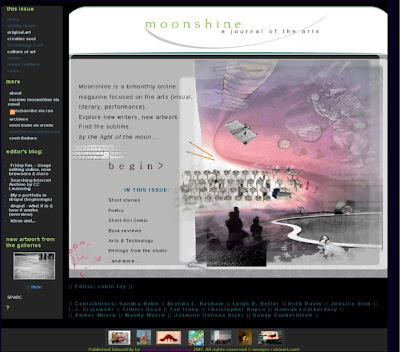 April’s issue of moonshine arts magazine is live. Writings, videos and podcasts. Subscribe via the RSS feed, pageflakes, or the facebook application. You can see the covers (my graphic design) here. I’m snipping this out for myself with the search links, of course (i.e., just click the link to execute the search in IA). The IA has great stuff for digital collagists, movie makers, & other arty folks. I used stuff from the Prelinger Collection to make my movie about cataloging and also for my digital collage on communication. Can I search by Creative Commons License? Yes, you can. But it’s a little complicated. So if you’re looking for Attribution Non-commercial No Derivatives (by-nc-nd), you’d put this in the search box: /metadata/licenseurl:http*by-nc-nd/* And you’d get about 33,000 items back. If you want to use this in combination with other queries, like “I want by-nc-nd items about dogs” you’d do this: /metadata/licenseurl:http*by-nc-nd/* AND dog And you’d get 195 items. The AND tells the search engine all the items returned should have that license AND they should contain the word dog. AND has to be in all caps. This breaks my heart. I have a collection of polaroid cameras from the late 60s – 80s and I use the film for art projects. For those of you interested in arts & tech stuff, check out Elliot Boswell’s Painting du Jour videos at Youtube. <a href=”http://www.southerncreativity.com/moonshine/issues//article.php?id=67″>Here is a little interview</a> with him w/ embedded youtube, of course. Also, I wrote a brief piece on digital identity for artists. Lots of great writing on board for December’s issue, so do check it out. The fiction, poetry, and short stories are getting better with each issue. For those of you interested in arts & tech stuff, check out Elliot Boswell’s Painting du Jour videos at Youtube. Here is a little interview with him w/ embedded youtube, of course. Also, I wrote a brief piece on digital identity for artists. I uploaded a rather large (and upside down) photo to pixenate, a free online web editing tool that even works with facebook.Pixenate tools include zoom, crop, resize, rotate, red eye, whiten, saturation, a few other features. Pretty nifty and easy to use. When you’ve finished, you can import to flickr or save. Steve Museum is a largescale tagging project which is supported by an ILMS grant. Partners include the Met and the Guggenheim. The Cleveland Museum of Art (a Steve Museum partner) has a “Help Others Find Me” button, which allows users to enter tags.